Today Arcep is publishing new coverage maps that deliver a four-tiered evaluation. Tested in the Nouvelle-Aquitaine region during the first half of the year, this more detailed snapshot is now available for the whole of Metropolitan France. 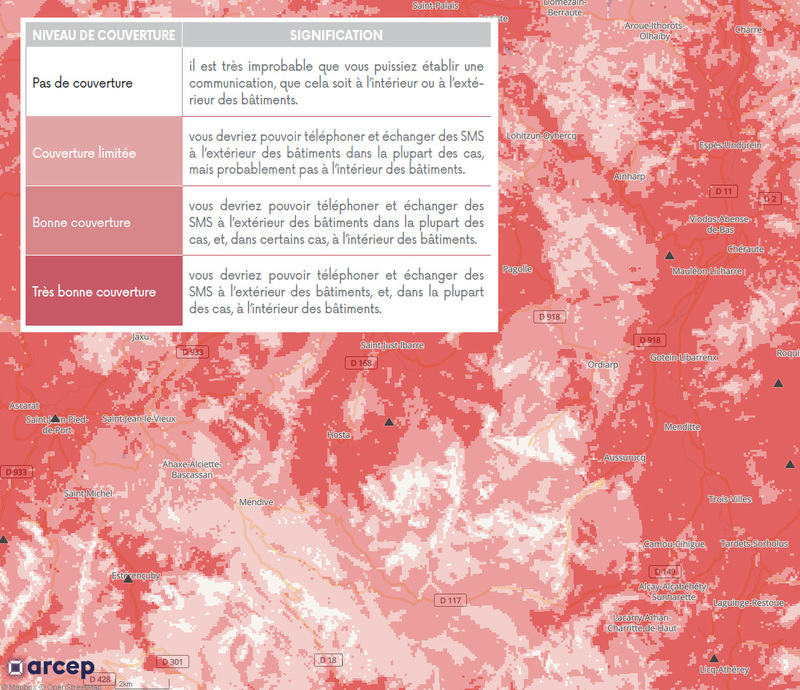 These maps have also been incorporated into the application launched in March: monreseaumobile.fr. At a time when mobile connectivity has become a vital issue for every region, by enabling an accurate diagnosis, this tool can help in drafting targeted public policies . Following a decision from Arcep, mobile operators are now required to publish coverage maps that distinguish those areas with very good coverage, good coverage, limited coverage and no coverage for mobile calling and SMS services. These more detailed coverage maps will make it possible to reflect the reality of the user experience more accurately. With these new maps, Arcep hopes to spur operators to further improve their mobile coverage. The aim is to use a heavy dose of transparency to redirect the basis of competition between operators, so that it not be focused solely on prices but also on network performance. These enhanced coverage maps are also a jumping off point: a clear diagnosis can be obtained by identifying those areas where coverage is limited, which then makes it possible to accurately target future coverage needs. The goal: encourage and improve payback on mobile operators' investments in regional connectivity. second, quality of service measurements taken under real-life conditions. These data provide a perfect representation of reality in the field but, by their very nature, do not make it possible to obtain an exhaustively detailed snapshot of the situation across the country. Users can therefore compare the different operators' performance. The aim is for this data-driven approach to regulation to create a virtuous circle : users' informed choices will encourage operators to invest in increasing their coverage ; those operators that commit themselves the most will see their efforts rewarded by consumers , which in turn will enable them to earn a return on their investments . Thanks to the Digital Republic Act of 2016, which introduced specific provisions regarding the publication of these maps as open data files, Arcep is also making these maps - and all of the data on monreseaumobile.fr - available as open data . Making these data available to the public means that anyone can use them, to test their accuracy and to create new comparison engines for mobile operators' coverage . Arcep thus invites interested organisations and enterprises to make use of the new data to develop new applications. Two successive laws increased Arcep's powers and responsibilities, and enabled the creation of this new system. The "Growth and Business" Act of August 2015 and the Digital Republic Act of October 2016 gave Arcep the ability, respectively, to define more detailed coverage maps and to publish them as open data. Arcep took on these new responsibilities back in 2015, performed the work required to fulfil them and, in December 2016, adopted a decision that aims to give mobile phone users the means to determine more clearly, for every operator, those locations with good quality coverage, and those where there is still room for improvement. What comes next: In 2018, Arcep will also begin publishing data on French overseas markets. Arcep also has plans to enhance coverage maps for data services, and particularly 4G data maps, between now and 2018.